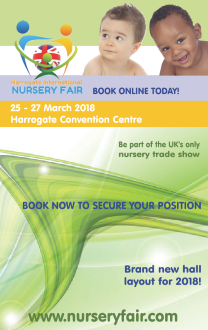 Exhibitors at Harrogate International Nursery Fair joined in celebration today as the Baby Products Association announced the winners of its 2018 industry awards. The winner of the Concept & Innovation Awards was announced as Lee Cowan and Dean Mortimer of sandsliders. The judges were impressed with the simple, yet clever product to allow a pushchair to travel across unstable ground such as sand and gravel. The award was presented by Sara Ludlam of 3Volution which sponsors the Concept & Innovation Awards each year. The two runners up were Charlotte Lonngren with Secure & Seen Playpen; and Anita Hill with Comfyse Cushy Cushion. 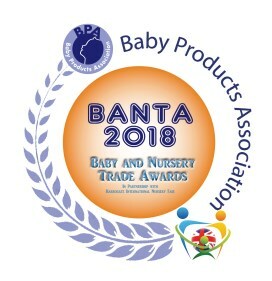 The Baby and Nursery Trade Awards (BANTAs) had four categories this year, Travel, Nursery, Home and Best New Product. 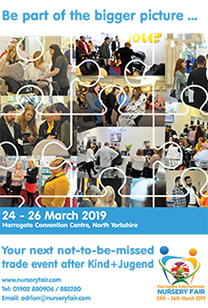 The winner of Travel was Roma Prams with its Moda with judges commenting that the product is a stylish, affordable and functional 3-in-1 travel system; the Highly commended product was Cosatto with its Hubbub Britpop ISOFIX car seat. The winner of the Nursery category was OBABY with its Stamford Furniture Collection with judges choosing it because the range is an affordable, traditional sleigh room set with multiple colour options including an independent retailer exclusive. The Highly Commended product was Whisbear ezzy the sloth. The winner of the Home category, with judges commenting that the product is fantastic value for money and loaded with features and functions, was The Red Kite Baby Co with Jumparound Jungle. Highly Commended was The Daddy Bag Snuggle Soother. There were numerous entries in Best New Product, but the overall winner impressing judges with its super compact, lightweight, incredible travel friendly and extremely easy to fold design, was Roma Prams Capsule Travel Stroller. BabyStyle’s new Oyster 3 was Highly Commended.